Place slices of angel food cake on a plate. Using a pastry brush or just a spoon, brush the orange rum over both sides of the angel food cake. Place blackberries and peaches in a bowl, then add 4 Tablespoons of orange rum. Gently toss together then set aside for flavors to marry. Cut angel food cake into pieces to fit into trifle glasses. 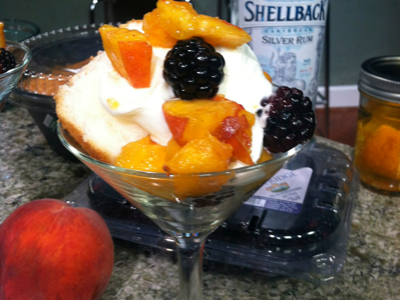 In martini or small trifle glasses, layer angel food cake, berries then orange rum cream. Finish with the fruit on top of the cream and enjoy! Using a bowl and beaters that have been kept in the freezer to keep cold, beat heavy whipping cream, powdered sugar and orange rum until peaks appear.